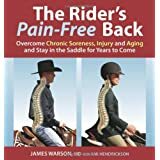 Posted on February 27, 2015, in Back Pain, Chronic Disease, Equestrian, Recommended Products and tagged back pain treatment, James Warson, low back pain, rider back pain. Bookmark the permalink. Leave a comment.